Author: Ansie Hoff. Series edited by: Klaus Keuthmann, Rainer Voßen. Through the ages, wooden sailing ships stranded on the west coast of the Northern Cape Province, South Africa, led to encounters between seafarers and the indigenous people, many of which we will never have knowledge. 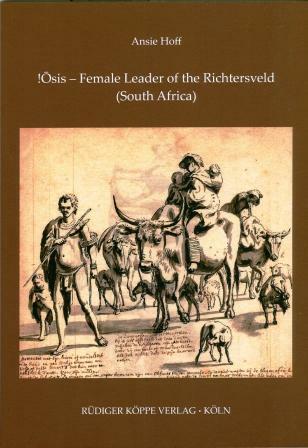 However, informants of the Richtersveld were especially enthusiastic about a particular ship that stranded at Boegoeberg on the coast of the Richtersveld in the 19th century, as this led to the castaways being assisted by !Ōsis, a much respected female Nama captain. The events, greatly valued by the informants, were first re­lated to the author in the 1980s. Hunter-gatherers were the first to utilise the area. However, !Ōsis, the Nama leader, confirmed the pres­ence of Khoekhoe herders in the Richtersveld before 1800. Little is known about the past ethnic composition of the Richtersveld, as well as reasons why people went to the area. Therefore, the purpose with this study was to arrange, evaluate and add to the information presented by the author’s informants, particularly by presenting the context in which !Ōsis acted. Furthermore, Ansie Hoff tried to explain particular actions of !Ōsis by means of Nama culture.